I recently acquired a copy of Mark Alan Smith’s book “The Queen of Hell” from Ixaxaar and decided to review it (I was actually persuaded to buy it after reading Freya Aswynn’s glowing review). The book itself serves as the grimoire for his “Primal Witchcraft of Hekate” current. I was first made aware of Mr.Smith’s works because he is a fellow contributor to the “Hekate: Her Sacred Fires” book put out by Sorita d’Este, with his entry entitled “Baptism of Fire”. I found the entry particularly interesting because he mentions having worked with Hekate along with the “Horned God” all his life, which is a combination that I myself work with. His narrative then goes on to describe how Hekate revealed The Horned God’s true face as Lucifer and his very intense initiatory experiences with them (Note: Mr.Smith defines Lucifer as being a pre-Christian being of light and gnosis, not the knee-jerk image of “The Christian Devil”). First off, let me say that the devotion that Mr.Smith feels for his goddess is evident. He speaks of her with the loving zeal of one who has dedicated his life to Her, and it shows. His passion is infectious, and his writing can hard to digest yet very powerful when you’ve had a chance to think about it. This is not light reading. It’s a ‘pour yourself a glass of scotch and lock yourself in the study for the night’ kind of book. 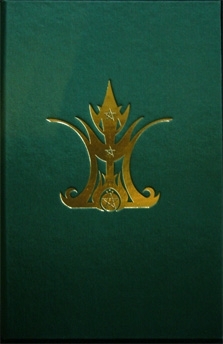 The book itself if a work of art, bound in shimmering green material with a gold emblazoned sigil of Hecate’s crown on the cover. Each book is individually consecrated with the authors own blood in a ritual that took apparently days. The book itself is meant to serve as a direct portal to Hecate. It indeed does feel “alive” and magical. You can tell that it’s not just another book, but that you are in the possession of something special. It is a true magical book. Only 999 copies were made and there will not be a re-printing, so it is a limited run. It is written in a true grimoire style. Although it does contain many rituals, it is assumed that the reader has the necessary background in witchcraft and magical evocation. Many techniques are mentioned in very general terms that leave the reader to fill in the blanks regarding the specifics (which in my mind is not such a bad thing). This is far from being a 101 text! The contents of the book feel like a cross between Andrew Chumbley’s works and Paul Hudsons “Mastering Witchcraft” and it is very much a combination of both folk and high magic. The first few chapters describe his Primal Witchcraft of Hecate current, which he names to be a system of Traditional Witchcraft under the auspices of Hecate the Witchqueen. The first chapter details the working tools, which are the classic tools of Wicca and ceremonial magic, namely the Athame, chalice, wand, and pentacle, along with an obsidian sphere to serve as a gateway. The second chapter goes on to describe the basic zone rite of the system, termed the “Cloak of Hecate”, which is basically a circle casting in Hecate’s name with Her symbolism overlaid into it. The poetry and invocations throughout the book are actually quite beautiful and do invoke Hecate quite well in my experiences! As a matter of fact, the first time I performed them I was brought into an intense communion with Hecate in which she detailed changes to his ritual format that I should make in order to personally derive the most benefit from them. I assume this fine tuning is necessary for each individual who works with it. Also included is a self-dedication rite to Hecate along with a sigil to have potentially tattooed on yourself. The rite itself is beautiful, and although I have not performed it yet, I look forward to doing so as part of my third required oath to Her sealing our bond. I think the most controversial aspect of this book is the pantheon that Mr.Smith includes with Hecate. Make no mistake about it, this book is dark! This is not the mythological Hecate that the authors speaks of, but rather a vision of her more akin to her role in the Chaldean Oracles, fleshed out with the authors own personal gnosis derived from years of work and channeled experiance. He describes Hecate as a creator God and places Her at top of his pantheon. He writes of her as the queen of not only the dark infernal realms, but of the luminous empyrean realms as well (though the book focuses solely on her role as the Queen of the Nightside paths). He pairs her in a pantheon along with Lucifer as the Witchfather and Belial the offspring and son of Lucifer. This I think is the biggest turn off for most people. He terms these three as the Trident of Witch Gods. I admit that this pairing gave me pause as well as it didn’t seem quite right to me at first. This is the major criticism I’ve seen others level at the work as well on various message boards. However, upon reflection I realized how closely this system mirrors Robin Artisson’s Witchmother/Witchfather/Master paradigm. As a matter of fact he writes about how Lucifer and Belial share each others natures and are separate yet fused entities, in much the same way that Artisson speaks of the Witchfather/Master. This has to make me wonder if Mr.Smith is tapping into the same current that Artisson describes (purposefully or not), a current which I myself find to be extremely accurate through my own experiences, simply overlaying his own preferences for names upon those ever elusive and changing faces. The rest of the book gets only darker, giving sigils and methods of invocation for various demonic and qliphothic forces to aid you in the work including the summoning of the Familiar, a possessory wolf spirit, a band of guardian wolves, the three Moirés, the Earth Dragon, vampires, and shadow entities. Of note is a section on protection and malifica, and even a specifically nasty curse to not only end your targets current incarnation, but to prevent them from ever incarnating again. Like I said, if you’re not comfortable with a bit of darkness in your magic, you’ll want to stay very very far from this book. If you are however, it might be your cup of tea. I should mention that there is a ritual given to balance your “dark” and “light” energies, invoking both Lucifer and the Archangel Michael into your body consecutively. The remaining section of the book details very intense rituals for traversing the dark tree of life and ascending to the throne of Hecate thereby attaining a spiritual state of elevation through Her initiations in conjunction with Lucifer. This is very advanced work, and if you’ve read the authors entry in Hekate:Her Sacred Fires it should give you pause for pursuing it unless you are really truly ready (note: I won’t be for many years!). This process begins with the Hecatean version of the toad bone rite! Although Mr.Smith makes it clear that the toad should be sacrificed without pain and not by the legendary traditional method of skewering it with multiple pins. In his interview on Witchtalk Radio he mentions that he found his own toad recently dead by car tire, which is a controversial yet common way to perform this rite these days (if I ever feel brave enough to perform the Toad Bone Rite, I’ll probably be on the lookout for road kill toads myself). The rituals get more intense and esoteric from there and I will leave it to the reader to decide if they want to obtain the book to learn more, for I will not be commenting on them. I’m on the fence on how I feel about the Lucifer/Belial aspect. I’ve never worked with either deities, though I do not refute that they are possibly aspects of the Witchfather I know. Maybe they are darker more base aspects? Taking the recent advice of Jason Miller to give each magical system it’s due without automatically tailoring it to fit your current comfort level (and negating all possibility of growth), I plan to at least give them a try and see how I feel about them. I personally have no problem with Lucifer or working with darker deities though I know for many this may be a turn off. It short, it challenges me spiritually and I’m personally up for the challenge. If it does not feel right then I won’t continue. I have a policy of never basing my practice solely on one book or system, no matter how good that system is. I will most likely be incorporating aspects of this book into my own practice, but not all of it. I definitely feel that it was worth the price to own it. My own copy was labeled 958/999, which leads me to believe that there are not many copies of this book available! I would offer my advice that if you are thinking of buying it, don’t think about it too long. where can i download “Queen of Hell”, “The Red King” and “The Scorpion God: The Forbidden Knowledge of Belial” free in PDF . thanks. Christianity acknowledges Lucifer as pre-Christian. I love accessing occult practitioners who are honest and revealing about their spiritual quests and discoveries. They often mirror my own spectral interfacing with demons and whatnot. While these episodes and other ‘spirit of truth’ events are almost always unwelcome, I strive to understand them, and the likes of Mark Allen Smith are invaluable. I love your blog and I am really delighted to find an article on the book “Queen of hell” to mark alan smith. I just started reading this book, and I must say that it pleases me well ^^. when you say that we can not mix the practices you mean? in my work with Hekate books Sorita d’este helps me a lot, and that of tara sanchez.this means that it is not consistent with the approach of Mr.Smith? Is it better to have an altar apart so?